Since I had moved from a one bedroom apartment to a 3 bedroom house with a loft, I had a significant amount of empty space and needed to find a purpose for each room. The room of the day has mirrored doors, perfect for selfies and what else but an exercise room?! Because of course, if I have an exercise room that means I will actually exercise. Right? Uhm. No. Ok. So the exercising didn’t really happen much upstairs. It got way too hot and was better downstairs in the family room. Although, who am I kidding?! The exercising has only happened a couple of times anyways. 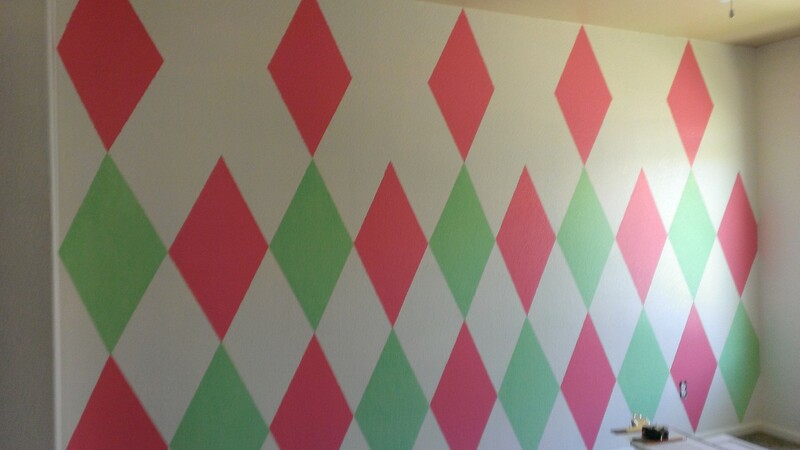 The room did serve as a great kids room for future roommates though since it had some fun colors. 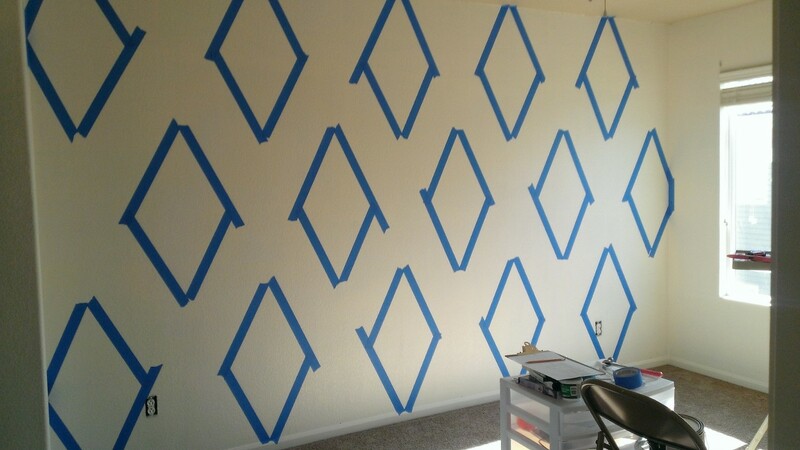 Onto the painting…I’ve seen this design prepped many ways including making diagonal tape lines across the whole wall. To save tape and be sure my diamonds were touching instead of having any space between them, I decided to go another route. 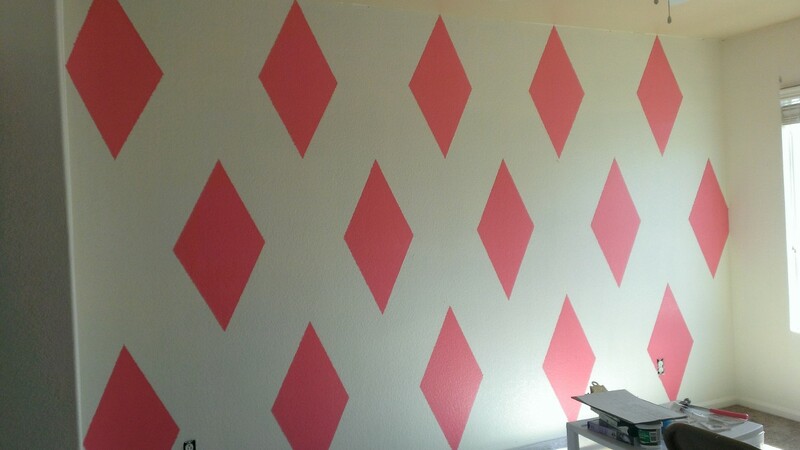 I chose to use white as the base color for my wall so the diamonds would not make the room look too dark. Because of this, I was able to paint the trim and walls all at once without having to do any extra taping. I again used my favorite America’s Finest paints tinted to Aspen White. Before marking my dots on the wall, I measured the wall and drew an outline on a piece of paper. I then divided to figure out how many diamonds I would need if I wanted 3 rows and I wanted the length to be double the width of the diamond. Once the diagram was complete, I put the dots on the wall, one dot for every corner of the diamonds. I used blue painter’s tape to outline the dots, making sure to put the tape on the outside of the diamond. I chose to paint pink as my first color. 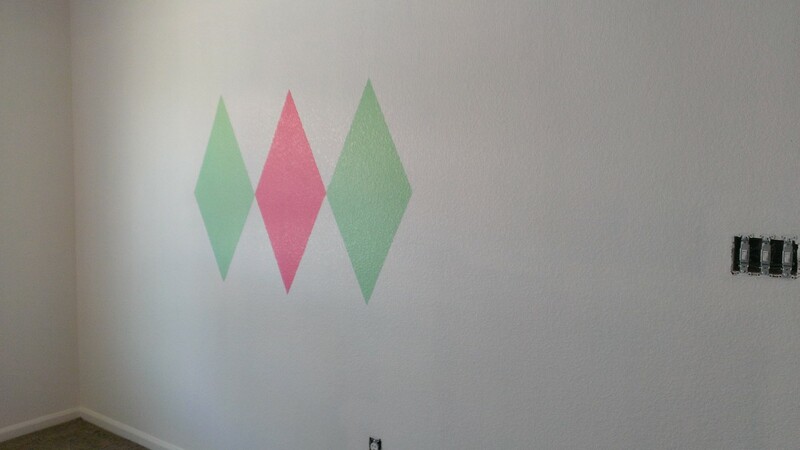 As soon as I finished painting the diamonds I removed the tape that way there was no chance of drying and peeling the paint off of the wall. One thing I did notice is that because my walls are textured, there was a bit of a fuzzy line on all of the edges of the paint. If I were to do this project again, I would caulk the inside tape lines of the diamonds prior to painting so the lines would be more precise. After painting the pink diamonds, I let the wall dry completely while heading outside to put together a new porch swing. Once the diamonds were dry, I was able to tape once from one pink corner to another making sure to tape over the pink so the corners would match up. Then, I used green to paint the new diamonds, leaving a white row of diamonds every other row both horizontally or vertically. I did the bottom two rows first because after painting the pink diamonds I realized the paint was drying faster than I could get the tape off. So for the green, I did the bottom two rows first because I could reach them and finish them pretty quickly. Then I removed the tape and finished the top row. 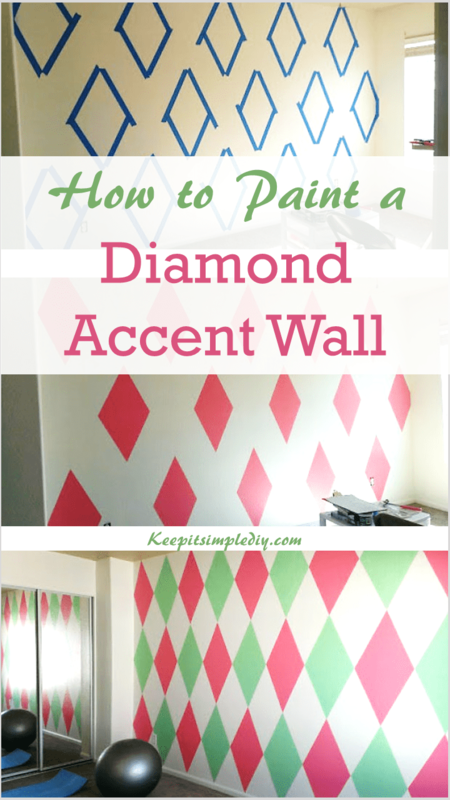 I also added a diamond accent to the wall across from the wall I’d been painting to tie the colors across to the other side of the room. Once the paint was completely dry, I reapplied all outlet and switch covers. I love it! 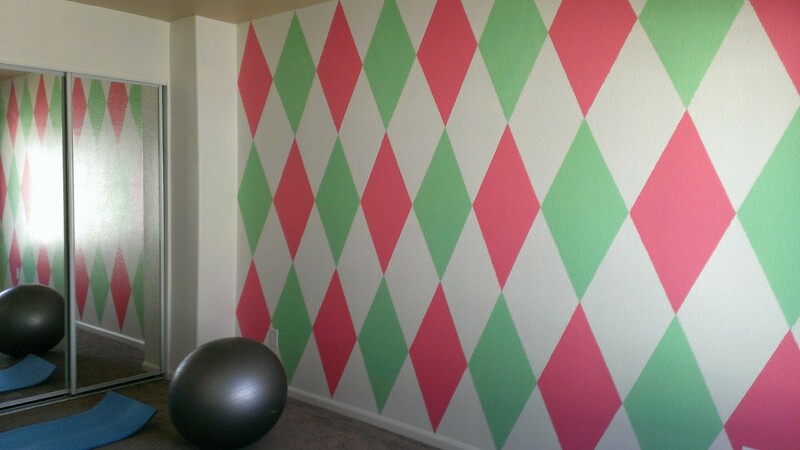 That would like great in my girls' room! I love that. So colorful, but simple! That would be great to add color to a room! Statement walls are the best! Such a cute idea! I love how it turned out! I might just have to find a wall and do this lol! Thank you for sharing! That turned out really good – very fun and I do like the colour combo!! So cute!! I love patterned accent walls. Ahh I love this! I will have to save this for when I buy a house someday! Awesome idea with the culk! Your wall turned out so great! I love the colors too! I bet my daughter would love this in her room! Thank you for sharing! LOVE it! What an awesome idea!! OMG this is awesome, will you come to my house and do it for me?!! So fun! What a great DIY! This turned out so cute! Great job!